We required as security deposit ( in case you confirm the booking) the 25% of the total amount that will be deposit -one month before the arrival- by the pax or by hostelworld in the bank account mentioned above. The rest of the payment will be done on the arrival at the hostel. 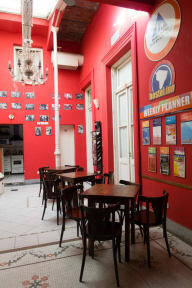 The Hostel Inn Buenos Aires is an old two-storey mansion with an outdoors terrace. The place preserves original front, ceilings, floors and marble stairs that had been redesigned combining the antique and modern designs. 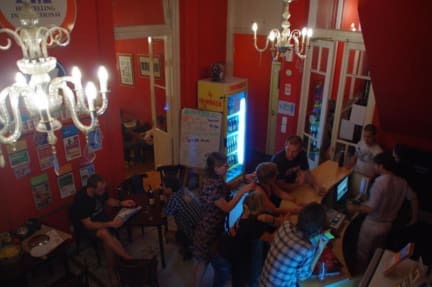 This is a warm comfortable hostel in the big city with a chilled out atmosphere, and a friendly and helpful staff 24-7. Located in the heart of San Telmo, the oldest neighborhood in Buenos Aires. This quiet area, mentioned in several tango lyrics, is very close to the most popular market: 'Dorrego Square' with tango dancers in the cobble-stoned streets. The 'plaza' is largely given over to antique shops and cafes. The property is also within walking-distance from Puerto Madero, known for it's many clubs and bars along the river. Few minutes by bus is 'La Boca' a lively neighbourhood, full of 'conventillos' (colorful houses) and known for it's immigrant roots, main road called 'Caminito' and same-named football team. Great Small Hostel! Hostels like these are what makes travel through Southamerica such an experience. It was great to be in a small place that felt like a community where you’re able to interact with everyone around you. The owners were really nice as well. If you’re visiting BA you should definitely stay there. Buenos Aires Hostel Inn was a decent place to stay. The hostel was located in a great location and the rooms were spacious and clean. Bathrooms were very clean with hot water! Nice breakfast! And perfect Wi-Fi! Great location, right near the subway. The staff are very helpful and attentive. The hostel is very beautiful! Great staff, nice breakfast, good location, right near to the subway. Beautiful decoration. Muy hermoso! 100% recomended!! Very nice, comfortable hostel with great breakfast. Very close to the subway. Bathrooms and rooms are very clean. delicious breakfast, very friendly staff and a very cozy atmosphere! Procurávamos um lugar com preço acessível para uma viagem de última hora, mas com boas avaliações. A 1ª impressão foi decepcionante, chegamos 11 da noite, com 500 pesos e o resto em reais (para converter no dia seguinte) e fomos informados que não aceitavam cartão de crédito ou débito.. (?) Estragou o clima de chegada! pessoal simpático, apesar de limpas, as instalações muito antigas, e café da manhã péssimo, que me fez repensar em mudar de hostel, mas se pretende só dormir e duchar, ele serve. Pontos positivos : staff maravilhoso, meninas incriveis. Inclusive me levaram p um passeio na cidade. Pontos negativos:Por ser um predio grande e antigo, tem o aspecto de sujo e mesmo q limpem ainda fica coisa p limpar; Cafe da manha fraco e repetido ( comparei com os outros hostels q fiquei); Das roupas de cama, somente os lencois sao trocados. Percebi q os cobertores sao usados por hospedes diferentes. Por fim, fui acordado as 6h da manha com alguem fumando e o cheio entrou todo no meu quarto. Pior hostel que já fiquei. Tirando o recepcionista da tarde, o resto da equipe é péssima. O lugar é sujo demais, os banheiros são nojentos. Toalha e roupa de cama sujas. A manutenção do local é péssima. Tudo quebrado: maçaneta, armários, box do banheiros, ralos. Horrível . Não vale o valor. Também tem o fato de terem um quarto ao lado da recepção e não tem limite de horário para silêncio. Impossível dormir. E quando fui reclamar um dos funcionários que estava falando super alto achou ruim.